Coffee of the line I’M FIT is the full taste and aroma of coffee enriched with a portion of high-quality protein and complemented with magnesium and vitamin B6. It is a fantastic alternative for regular coffee thanks to the content of a number of nutrients. Coffee is one of the most popular stimulants in the world. It provides stimulating caffeine that gives an energy boost and it has the inimitable taste and aroma that coffee addicts adore. Unfortunately, it also has the property that forces many people to limit it or even give up on it – it increases the risk of magnesium deficiencies. They manifest themselves by painful muscle cramps, they distort the functioning of the nervous system, and cause sleep problems. The producer of the line I’M FIT, the company Activlab, decided to respond to the needs of those who love the black beverage but are worried about its side effects. They enriched coffee with magnesium carbonate, a highly assimilable form of the mineral, thanks to which it not only does not increase its deficiencies, but it even helps to prevent them. Apart from the content of magnesium, the coffee is also attractive for every physically active person because of its high content of proteins. Each portion provides as much as 20 g of proteins in the form of a pure whey protein concentrate used commonly as a dietary supplement because of its high bioavailability and optimal amino acid profile. That way, the product not only constitutes a tasty and aromatic form of stimulation, but also a highly nutritional addition to the diet that helps to ensure proper protein supply. The coffee was also enriched with vitamin B6. It is a precursor of many coenzymes, which makes it essential for the normal process of many biochemical reactions in the organism. It participates in the process of nutrient digestion, determines normal energy management in the organism, and affects the efficacy of the nervous and cardiovascular systems. Its deficiencies lead to emotional disorders, immune system dysfunctions, and mucous membrane inflammations in the oral cavity. Despite many additional advantages, high-protein coffee does not lose the properties so typical of its traditional version, which has gained such a wide group of fans. The manufacturer managed to maintain the full taste and aroma of latte, that is coffee with milk. Moreover, the addition of caffeine gives the expected energy boost, exerting a stimulant effect and improving intellectual functions. 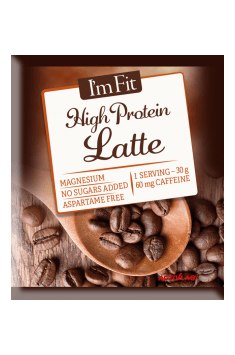 To sum up, high-protein coffee I’M FIT is a fantastic alternative for traditional coffee, great for all physically active people. It has the same stimulant effects and at the same time provides a portion of proteins and prevents magnesium and vitamin B6 deficiencies. It can be used as a hot beverage with additional nutritional value, but it can also constitute a high-quality protein complement to a meal. Dissolve the content of a bag (30g) in 200 ml of water. The product can also be used for preparing dietetic versions of desserts containing coffee, such as tiramisu. It will provide the characteristic aroma of coffee but also its very typical sweetness, making it possible to avoid adding sugar. What is more, it will enrich the dessert with a portion of proteins, giving it additional nutritional value.